The Life Of Faith: My baby is 6 months old! You are in the 50th percentile which means you are just perfect. But I already knew that! Here's your big news for this month....ready? You have learned how to CRAWL! Yes! Can you believe it? You started off just being able to scoot yourself backwards. You would get so frustrated trying to get to whatever was in front of you when all you could do was move backwards. You are a stubborn little thing, though, because you tried time and time again until you have finally figured it all out. I had to video it as soon as we saw you. Now mommy doesn't get anything done at home because I'm busy chasing you and taking everything out of your mouth! You are sitting up on your own really well now too. I can leave the room with you sitting up and you go from sitting to crawling on your own. Occasionally you face plant, but not hard enough to harm anything! Teething: There is a tooth visible! It's just the tip of it on the bottom left. We have started using Hylands Teething Tablets for the times when it seems to be hurting you pretty badly. Eating: We started you on solids this month...well kind of. They still aren't a staple part of your diet, but more than anything just a fun experience for you to try new foods! We are taking more of a Baby Led Weaning approach which I'm pretty excited about! Here's how your first time eating solids went. We gave you avocado! Sleeping: Sleeping has been up and down for you. Up until last week you were still getting up 2x a night to eat. I think we have cut it down to one now. You go to bed around 8:30 and wake up around 3 and then 7:30. I can't complain! Your naps are pretty consistent now too. You usually take 4 a day. Memories: You took your first plane ride this month. I was SO nervous! I prayed that your ears wouldn't bother you too badly. Surprisingly it didn't seem to hurt you one bit! We had so much fun on vacation with my family. I was especially excited that you got to meet my sisters, brother, and all your cousins that you had never met before! You also got to meet your great grandparents. It was so fun to see you with your cousins. Your Abuela and Grandpa couldn't have been happier! We went on vacation up north to Lake Superior. It was beautiful! You also got to meet mama's cows! And you weren't even afraid of them! The cutest thing was seeing you with your cousin Reagan who is just a couple months older than you. I hope you guys will be best friends! We are definitely enjoying our summer together. I love that I can be home with you making all these memories! You took your first trip to the Zoo while we were in Minnesota and then again a few weeks later we went to the Zoo here in town! Here you are all ready for your adventure at the Zoo...hat and all! You took a mama and baby bat photo with me. It turned out awesome! Your favorite animals seem to be zebras and giraffes! We are having so much fun together. I wish you would be able to remember all of these great times together...I guess that's why I take so many photos. I promise you are having a blast:) Here's some photos from your first time in the pool. To say you loved it is an understatement! You already are having fun with your cousins...you have so many of them and there is even one more on the way to add to the fun! I don't even know where to begin with you and your daddy. You always have smiles and squeals for him when you see him. On Father's Day, you gave him kisses for the first time. Pretty sure that was more special to him than the photo mouse pad and pictures of you that we gave him. He loves you so much. You have no idea how blessed you are! You are such an expressive baby and so fun to watch. You do this adorable eyebrow thing where you raise both eyebrows up when you are looking at someone. It cracks us up! Just a few weeks ago, you started waving. It is the cutest. thing. ever. Sometimes you get so excited that both of your arms fly up in the air and you just squeal like none other. You are such an amazing addition to our family. We love you so much and thank Jesus for the blessing you are in our lives. Phew! I can't believe we did all that in a month's time! We've been busy and you've done so much growing up. Looking forward to all the wonderful memories month 7 brings! 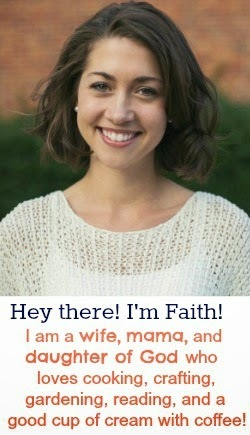 Where do you find her clothes, Faith? She always has the cutest outfits on! Thanks Sarah! Most of her clothes are from yard sales...yard sales are AWESOME for baby clothes. It's kind of hit or miss but when I find a good one, I stock up! She is precious and growing like a weed huh? Great yet awesome pictures. My fave definitely has to be the one with the cow. Too stinking cute. Thanks! Yes she is a fast mover already! If Kaleigh is 6 months that means Bug is going to be 6 months soon! Ah! I don't know if I'm ready for this! 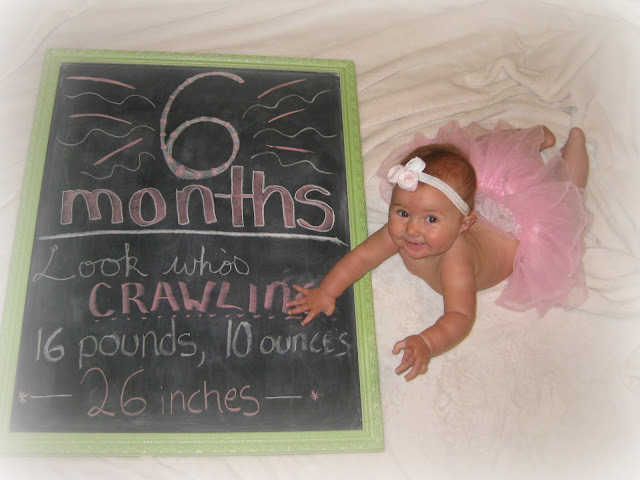 I love the video of her crawling! Jo is working so hard at it and she wants to so badly! Aww I know Alli! Isn't it crazy how time flies. Won't be long and Bug will be crawling too!! You two had such a busy month! I can't believe she is crawling!!! I cannot even imagine Aislynn crawling yet. I can't get over how much she looks like her little cousin, their faces are so similar! Oh she is just precious! Thanks for sharing on the Weekend Reads link up! Would you give up your plans for His?